Rembrandt’s Ascension is sometimes dismissed as one of his less successful works. 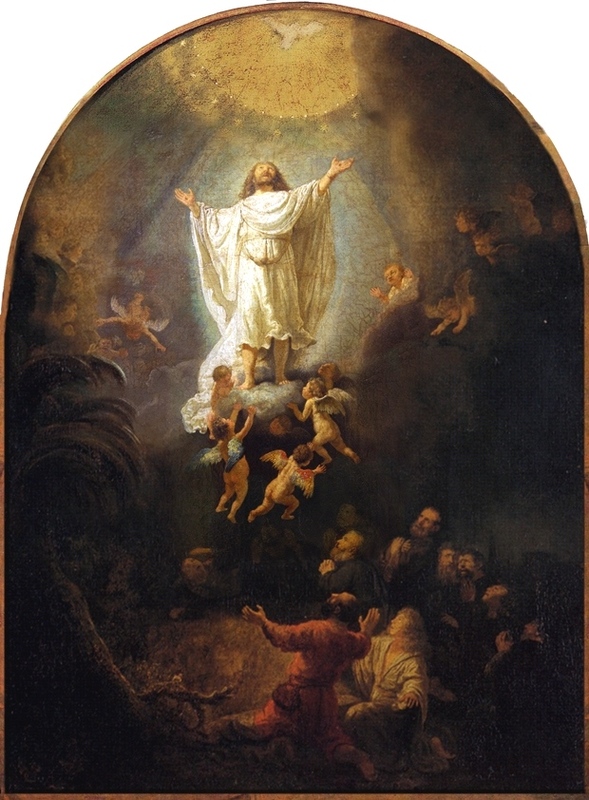 It is one of a group of paintings – the Entombment, the Resurrection and the Ascension – commissioned by the Dutch head of state, Stadtholder Frederik Hendrik, to hang in his private art gallery in The Hague. It was a huge and important commission that could further establish Rembrandt’s rising reputation and yet it seems to have caused him considerable difficulty. One suggestion is that the theme itself required Rembrandt to shift gears, from Rubensian Baroque drama to something more contemplative. Another is that the subject tended to conflict with his naturalistic instincts. This is not one of those Rembrandts that seem to peer deeply into a man’s soul. We see a group of disciples simply staring in awe as Jesus is taken up to heaven. The scene is lit from above and the heavenly light filters down to the faces of the disciples, symbolizing their genuine but partial understanding. At the left-hand side a giant palm tree – a symbol of God’s people – holds the two realms of heaven and earth together. And yet, perhaps its simplicity is a strength. What else is there to show? Isn’t staring in awe exactly the right response? Jesus has been raised from the dead and has been with the disciples for 40 days. That was amazing enough. But now he has been taken bodily into heaven. What does that tell us? Jesus was not the only person in the Bible brought back from the dead: the son of the widow of Zarephath (1 Kings 17:17–24); the Shunammite woman’s son (2 Kings 4:18–37); the son of the widow of Nain (Luke 7:11–17); Jairus’ daughter (Luke 8:52–56); Lazarus (John 11); various ‘holy people’ in Jerusalem at the time of Jesus’ death and resurrection (Matthew 27:50–53); Tabitha (Acts 9:36–43) and Eutychus (Acts 20:7–12). But all these people subsequently died again. Jesus is unique. Death never had any hold over him. So Jesus freely gave himself up to death for our sakes and for our salvation and freely took up his life again, never to die again. And to underline this wonderful truth, Jesus’ body is taken physically from this earth and he now stands in the presence of God. It is thought that in this work Rembrandt moved away from the influence of Rubens and modeled the composition on Titian’s huge altarpiece, the Assumption of the Virgin (1515–18) in the Basilica di Santa Maria Gloriosa dei Frari in Venice. This may account for the rather uncharacteristic cluster of winged putti in the Rembrandt. But Rembrandt, typical of his Protestant heritage, has made the scene entirely Christocentric. Whereas in the Titian the putti push up the cloud on which Mary is taken upwards, in the Rembrandt they are more adoring than for weight-bearing. In a similar way, where x-rays show that Rembrandt, like Titian, originally showed God the Father in the top of the picture, receiving Jesus, he eventually removed this figure. The scene is therefore focused on Christ who, apparently of his own motive power, now ascends back to the Father, who is hidden in bright light. The slightly Baroque diagonal from the circle of watching disciples guides the eye to Jesus in the center, from where he appears to be rising directly vertically. When Stephen, the first Christian martyr, was on trial, he was given a vision in which he saw Jesus standing at the right hand of the Father: ‘“Look,” he said, “I see heaven open and the Son of Man standing at the right hand of God”’ (Acts 7:55–56). This statement was so shocking to the Jewish leaders that they covered their ears and had Stephen dragged outside and stoned to death. The idea of a man standing in the presence of God was anathema to them. And yet, that is what we celebrate this week at Ascension-tide. Jesus was taken bodily into heaven. Mysterious as this is – for where exactly is Jesus’ body now? – Luke is emphatic that like all the resurrection appearances this event too is attested by eye-witnesses (Acts 1:9). And so we have one more powerful demonstration that Jesus really is both perfect God and perfect man. It is a truly amazing fact: that a man really does stand in the presence of the Father. And he stands there representing us human beings. It is precisely because he stands there, as our friend and brother, but also as our High Priest offering the sacrifice of his own life on our behalf, that we have hope and confidence to face our own deaths, knowing that we will one day be re-clothed in resurrection bodies as he was (1 Corinthians 15). Rembrandt shows the disciples rapt in awe as they see Jesus glorified. They will now have to go out into a hostile world spreading the great good news of the gospel and each will pay dearly in his own flesh for the privilege of this witness. But each does so because they have seen with their own eyes the truth of the resurrection and the ascension and they are therefore sure in their faith and their hope. Rembrandt: The Ascension of Christ, 1636, oil on canvas, 93 x 69 cm; Munich: Alte Pinakothek. Rembrandt van Rijn (Leiden 1606 – Amsterdam 1669) was a Dutch artist known for a lifetime of painting penetrating portraits and self-portraits as well as perceptive and ever more pensive representations of biblical subjects, both in etchings and oil paintings.